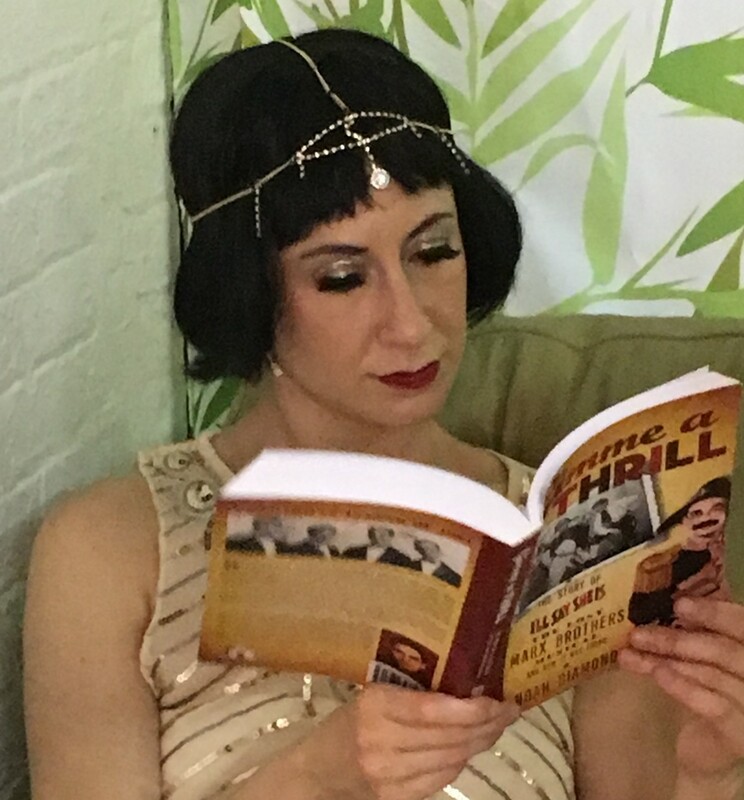 During the dreamy experience of the Off Broadway run of I’ll Say She Is, the Lost Marx Brothers Musical, at the Connelly Theater, I’ve been so busy, doing so much, I’ve barely had a moment to catch my breath and reflect on what’s happening. Now, a couple of weeks into the run, that’s still essentially true, and it might be best that I not step back far enough for reflection at this point, anyway. But my heart is so full these days, I’ve got to get some of this out to you. So here, composed largely in haste, on my phone, on subways and in taxicabs, is an account of life at I’ll Say She Is. On days when there’s an 8:00 show, I usually arrive at the Connelly in the mid-afternoon. If I’m the first to arrive, I walk in the darkness through the lobby and into the auditorium. 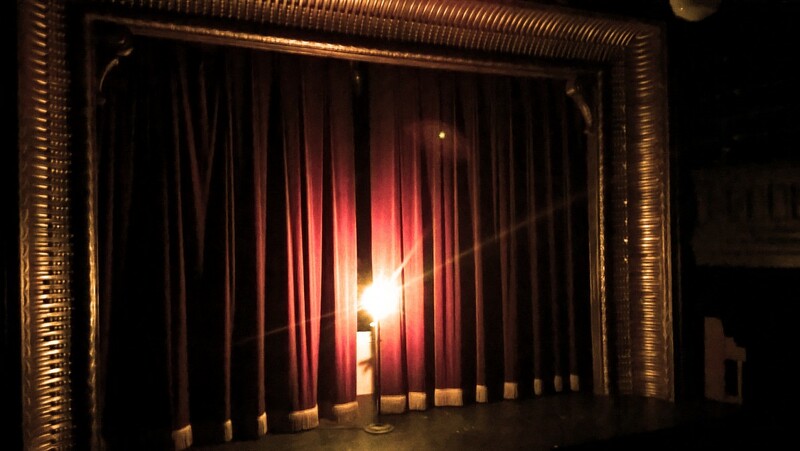 The beautiful, antique grandeur of the Connelly’s proscenium (pressed tin, painted gold) frames the red curtain (with gold fringe, of course), illuminated only by the ghost light. A ghost light, for non-theatre folk, is a naked bulb atop a pole on a stand, always left burning downstage center when the house is dark — a theatrical tradition going back at least to the dawn of electric light. For me, there is no image that more aptly or more movingly sums up what we mean by the phrase the theatre. The ghost light is a convention of theatres, auditoriums in the classic sense — not performance spaces, not blackboxes, not studios, but haunted palaces of the performing arts. If I’m not the first one there, the lights are already on. Tom Bibla, our intrepid technical director and lighting designer, might be refocusing stage lights or adjusting cues. Sound guru Rich Konert might be testing microphones or reviewing the previous night’s sound mix. These guys are forever tinkering and making improvements, and it’s partly thanks to them that the show looks and sounds better every night. Stage manager Sarah Lahue is another frequent early presence, organizing prop presets and restoring order to the backstage wings, generally left in glorious tumult after the previous show. A performance of I’ll Say She Is requires a frankly ridiculous number of props, and this multitude is organized on Sarah’s tables, in her spreadsheets, and, somehow, in her head. And Amanda Sisk is almost always there. She might be hunched intensely over a stuffed lime-green binder, wielding a mechanical pencil like a scimitar — making adjustments to the curtain call; adding, deleting, or rearranging gags based on audience response; or addressing the ongoing challenge of our beautiful but fussy stage curtain. (If you happened to catch the show on June 10, you got to hear me, as Groucho, attempt to spin comic gold out of a curtain which refused to open or close when we wanted it to.) (Update: It works beautifully now, folks; thanks for your patience!) Amanda’s invention and dedication are matched only by her unerring sense of what’s correct for this particular musical. I’m tickled and delighted that this woman, who’d never seen a Marx Brothers movie when I met her almost twenty years ago, is now their director. The show is packed with authentic (but new) gags and ideas devised by Amanda Sisk, any one of which would have been appreciatively adopted by the Brothers themselves, had they been lucky enough to work with her. A brief tour of the Connelly Theatre lobby, as Marxed up for our engagement, accompanied by Eine Kleine Illsaysheismusik. My own duties usually begin in the lobby. My experience as the erstwhile box office manager at HERE Arts Center prepared me well for overseeing our front-of-house setup. I gave the Connelly’s lobby its makeover into a Museum of I’ll Say She Is, and my dear friend and indispensable onstage foil Kathy Biehl contributed such enhancements as the World of Thrills map, where audience members stick pins to indicate the distances they’ve traveled to see the show. I neaten the artifacts on display, add new clippings to our media board, and set up the computer to await the arrival of our house manager, the great Brett Leveridge. When I switch to actor mode, front-of-house is in Brett’s able hands, and he steers the ship with grace and aplomb. My last lobby task is to take the merch out of storage and arrange it tastefully on the shop counter. The show’s tee shirts, caps, magnets, and Groucho glasses are four reasons to be grateful for my day job as a designer of Broadway merch and souvenir books for Max Merchandising — call ’em for all your theatrical swag needs! Also enlivening the shop counter is a special preview issue of The Marx Brothers From Birth to Broadway, a forthcoming graphic novel by my pal Rik Sansone; copies of the New York Morning Moon newspaper used onstage in the show; and my book Gimme a Thrill: The Story of I’ll Say She Is, the Lost Marx Brothers Musical, and How it Was Found. The June 12 mike check: Corrado Alicata, Melody Jane, Noah Diamond, and Matt Walters. Notice that Melody has the mike tape. Photo by Amanda Sisk. M-A-R-X — ho ho ho! Soon my dollop of cheeky invention was put to shame by our ridiculously talented cast, and the sound check became a joyous concert. The musical theatre contingent was led by Olivia Gjurich, whose Julie Andrews impression is at least as thrilling and uncanny as any Marx Brother’s performance in our show; Corrado Alicata, who responded to Rich’s request “Gimme your Broadway voice” with as legit a Phantom sound as has ever been heard; and Avital Asuleen, whose rendition of “Last Midnight” from Into the Woods made an apt companion to her whistling specialty, which is put to fine effect in “I’m Saving You for a Rainy Day” in I’ll Say She Is, but on this occasion seemed to reference Cinderella’s birds in Sondheim’s fairytale masterpiece. On poppier notes, Kathy delivered a soulful “Stand By Your Man,” and Melody Jane showed her 90s roots by wailing that Blind Melon song that I could never get away from in high school. Robyn Michele Frank sings at the June 12 sound check. 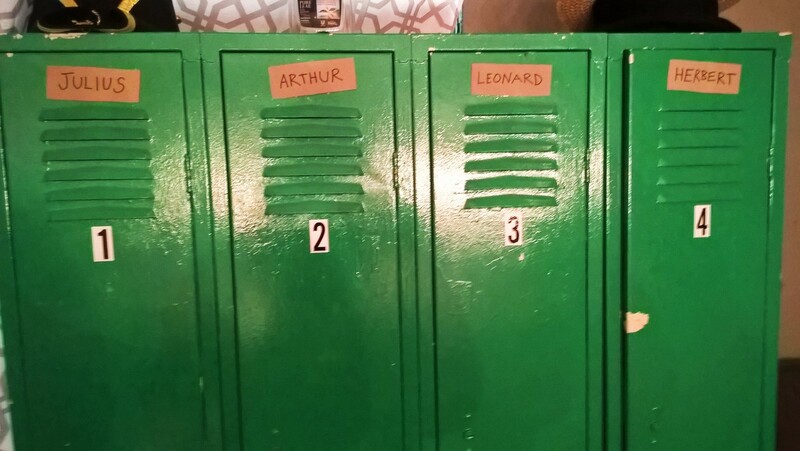 The lockers in the dressing room, labeled in tribute. I have a hamster sound. I am a hamster now. C.L. Weatherstone as Simpson. Photo by Stefan Timphus. Dante Adela might be sitting on the very comfortable couch in our dressing room, which is also frequented by Corrado Alicata between costume changes. C.L. Weatherstone should be sitting on that couch, and will be again. At the first preview, C.L. landed badly when jumping from the platform in the opium den scene, and he’s been out with the injury since May 29. 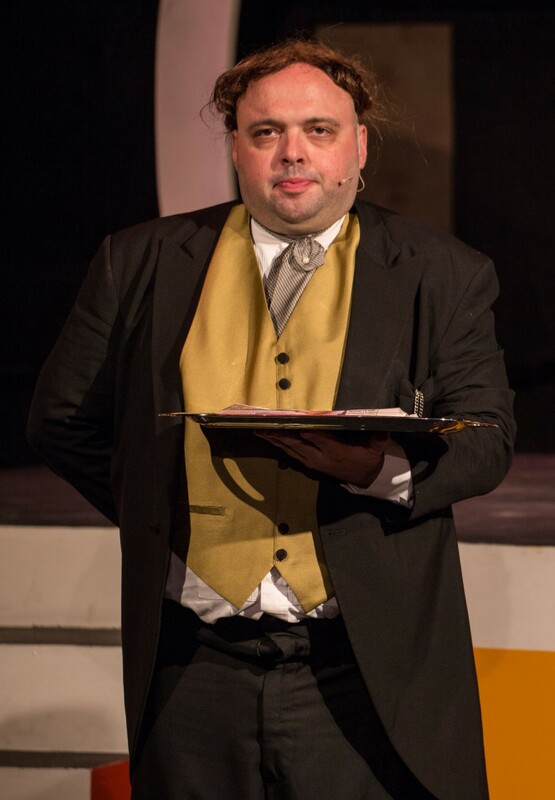 Corrado has impressively stepped into C.L.’s roles (Simpson the butler, Napoleon’s footman, and the Hop Merchant), besides his own roles as the “Wall Street Blues” soloist, “When Shadows Fall” streetsweeper, and others. Corrado’s work has been extraordinary. June 16 will mark C.L.’s return to the role of Simpson, and we’ll all finally be together again. Amanda or Sarah, in the rare moments when they’re not urgently busy, might also be found on that comfortable couch, joining in the hubbub; if Amanda’s there, there’s a good chance she’s singing. (It’s thanks to her that I am very likely the world’s only Groucho who has warmed up for a performance by singing “A Little Priest.”) Matt Roper is often standing in the middle of the room, laughing. Tonight, the gods look down and laugh. Amanda and Roper are amused by something; Seth is en route to Harpo; I am trying to join a club that will have me for a member. 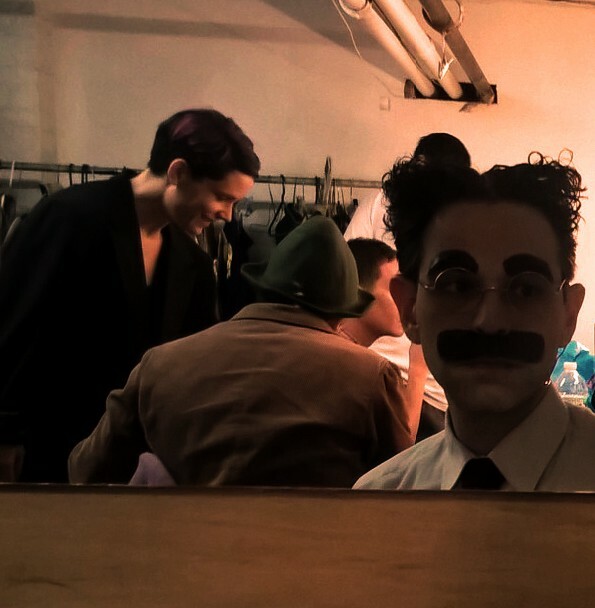 I sing a little to warm up, and I’m a light participant in the general banter of the dressing room, but I spend much of my time there looking gravely into the mirror, transforming my face and hair into as close a facsimile of the Groucho Marx visage as possible. It never looks quite right on initial application, until scrutiny discovers some blunting of an eyebrow end or rounding of a moustache corner and the look clicks into place. I look at Frank’s note and marvel again at his ability to apply the Groucho makeup perfectly, in full view of the audience, in about ten seconds, in An Evening with Groucho. He did it in Groucho: A Life in Revue as well. I guess, besides Frank’s natural deftness, it comes from doing it thousands and thousands of times. Occasionally Melody or Kathy will make an appearance on our side, and Amber Bloom often presides over the common area, but I have almost no details about what the scene is like beyond the common area, over in the women’s part of the dressing room. They seem happy. They have a hamster sound, they are a hamster now. That Broadway music! A palpable rage. It’s the sun and the stars and the moon. That Broadway music! It’s more than a stage. It’s the age of the Tin Pan tune. long as the lights of Broadway shine. and Broadway will give you a sign. 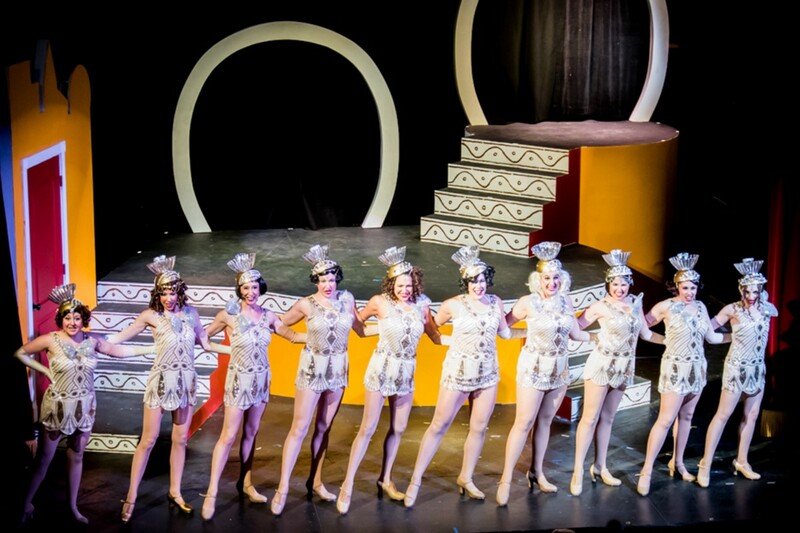 “This Broadway Song”: Jessica Webb, Ashley Rubin, Amber Bloom, Avital Asuleen, Caitlin Brunell, Olivia Gjurich, Sarah Miller, Peyton Lustig, Beth Conley, and Robyn Michele Frank. Photo by Mark X. Hopkins. 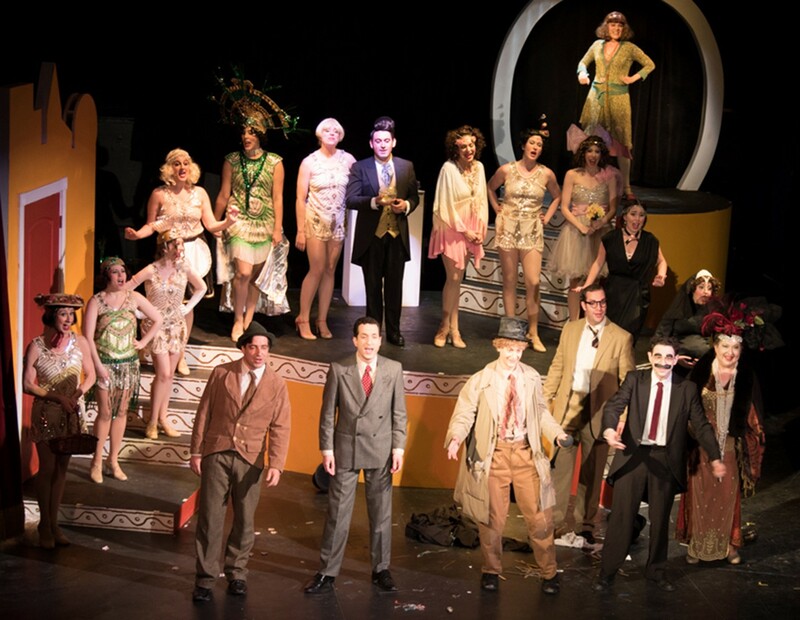 The opening number always gets a great response from the audience, but it, too, offers clues about the house. Is there applause on the first entrance (Amber, Sarah, Jessica Webb, Ashley Rubin, and Beth Conley)? Is there applause when the curtain opens, revealing the full chorus on the set? There are always cheers as well as applause at the end of the number, but when you’re backstage waiting to go on, even the intensity of these cheers, relative to those heard at the previous performance or the one before that, seems like valuable data. Nevertheless, we don’t really know what we’re dealing with until the Theatrical Agency sketch begins. If Zeppo and/or Chico gets entrance applause, we know we’ve got a crowd full of Marx Brothers fans and the performance is going to be sheer pleasure. If Zeppo and Chico don’t get entrance applause, but Groucho and Harpo do, it means we’ll be fine, but that the die-hards are either absent or restrained. 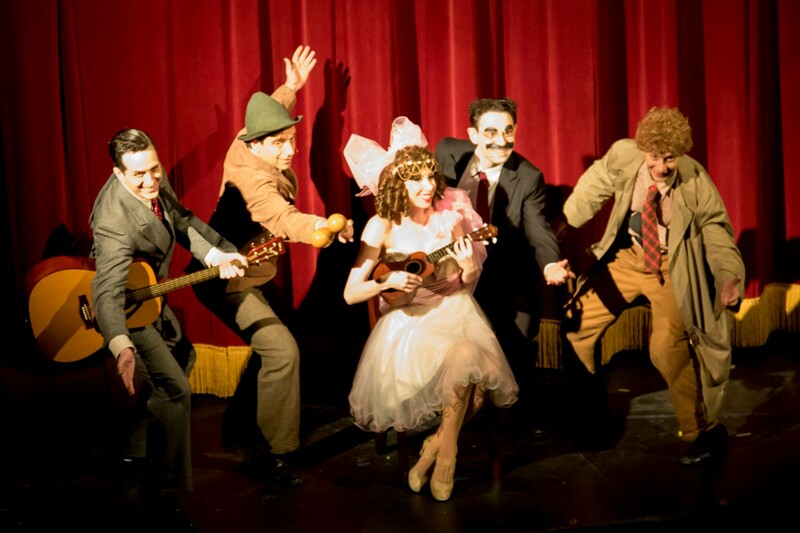 If Groucho and Harpo don’t get entrance applause, it generally means that the show is going to be a whole new world for this particular audience. We can win ’em over, but they’re not going to meet us halfway; they’re simply here to see a musical comedy. This has only happened twice in the run so far, but it’s of great interest, as we’re always wondering if enjoyment of I’ll Say She Is relies on previous knowledge of, and affection for, the Marx Brothers. Thus far the evidence is inconclusive. My impression is that Marxmania is not a prerequisite, but that it helps if there are fans in the audience whose laughter and enthusiasm hips the newbies. Melody Jane as Beauty in I’LL SAY SHE IS. Photo by Stefan Timphus. I’M NOT SURE people realize that Melody Jane’s role is the most difficult one in the show, because she makes it look so natural and graceful. In fact, she’s the lead character in the show — but she’s sharing it with these four madmen, and the show cedes her ground to them so decisively that she doesn’t even appear until twenty minutes into the first act. For this reason, her entrance has to have real impact, and in the bare-stage Fringe production, we always lamented our inability to make this a major visual moment. 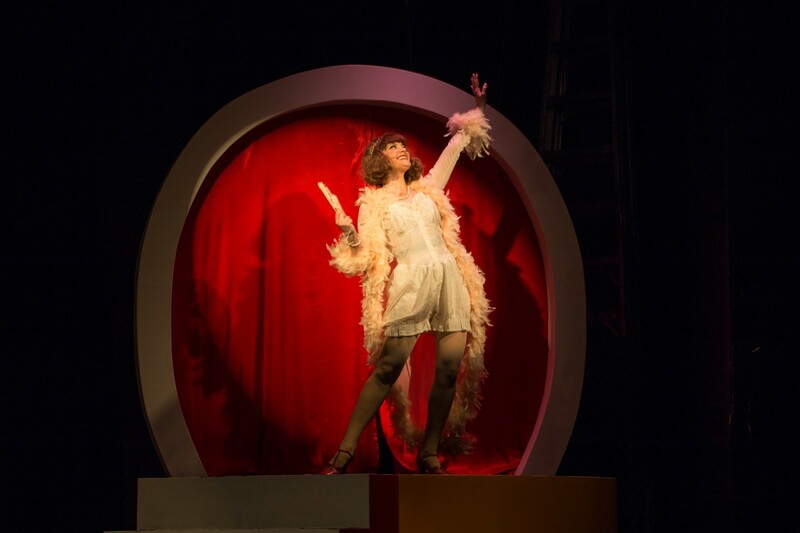 Now, in this production, the audience meets Melody when she emerges from a curtain atop a tower, and as she starts to sing “Gimme a Thrill,” she descends stairs decorated with the 1924 I’ll Say She Is curve design. It’s one of the key moments in the show, and one we’ve all thought about and fought for and struggled with, and every time it happens I get chills. 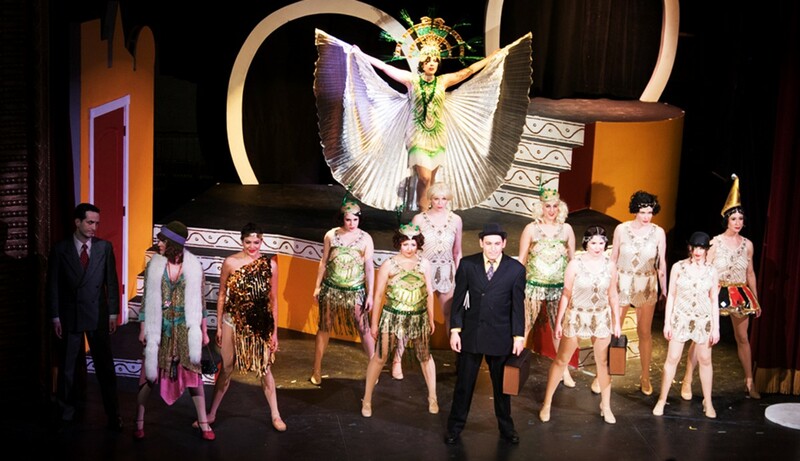 “Wall Street Blues”: Matt Walters (Zeppo), Melody Jane (Beauty), Caitlin Brunell (Gold), Beth Conley, Jessica Webb, Olivia Gjurich (above, as the Fairy of Wall Street), Jennifer Harder, Corrado Alicata, Sarah Miller, Ashley Rubin, Avital Asuleen, Robyn Michele Frank, and Amber Bloom (Roulette). Photo by Mark X. Hopkins. THE ONLY PART OF THE SHOW I get to watch from the audience’s perspective is “Wall Street Blues,” which I witness from a hiding place house left, or occasionally from the balcony. It’s the most complicated musical number in the show, in terms of both songwriting and staging, and I’m always wowed by it. “Wall Street Blues” is practically a mini-musical in itself, with numerous built-in specialties (Corrado’s masterful opening solo; the exquisite harmony work of Beth, Jessica, and Sarah as the trio; Olivia’s thrilling jazz vocals as the Fairy of Wall Street; Caitlin Brunell’s how-the-hell-does-she-do-that? dance of “The Greed for Gold”). If you’ve read Gimme a Thrill, you know that I used to worry about whether my lyrics for this number anticipate 1929 too much. 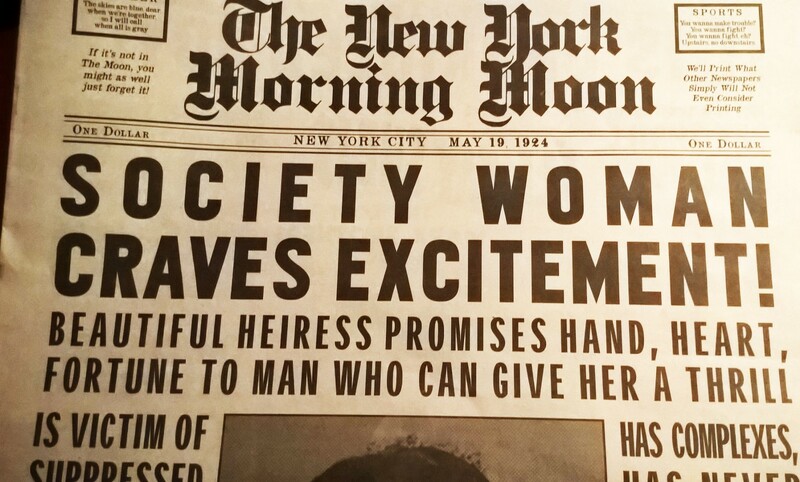 I’m not worried about that anymore, but it’s possible that the number itself, in its current form, anticipates 1940! 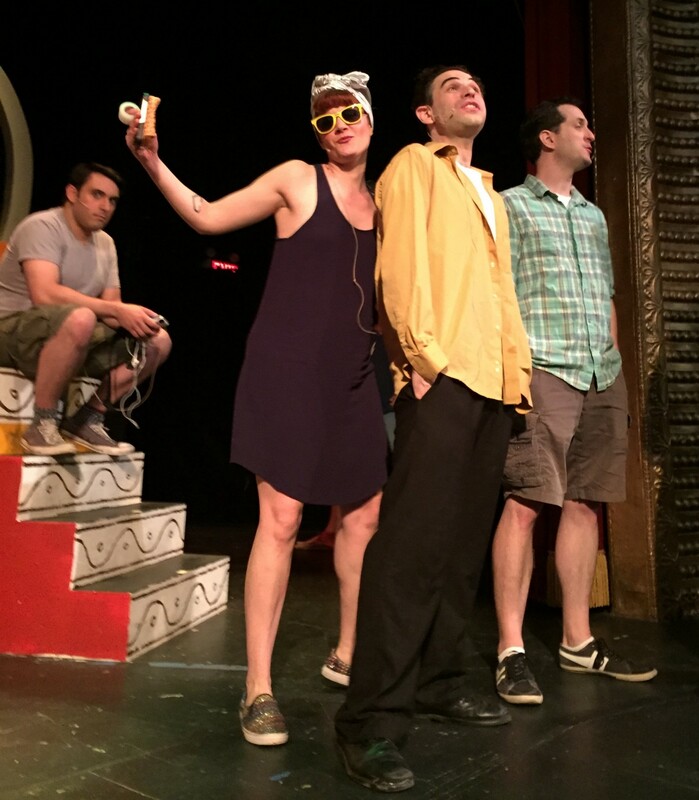 “Up in the Clouds”: Matt Walters, Matt Roper, Ashley Rubin, Noah Diamond, and Seth Shelden. Photo by Mark X. Hopkins. After “Up in the Clouds” I get a little break, because Groucho doesn’t appear in the Central Park sequence. I’m downstairs, hearing bits of “I’m Saving You for a Rainy Day,” the Harpo/Chico encounter, the Pygmalion ballet, and the Tramp ballet on the monitor, while I suit up for the Napoleon scene. 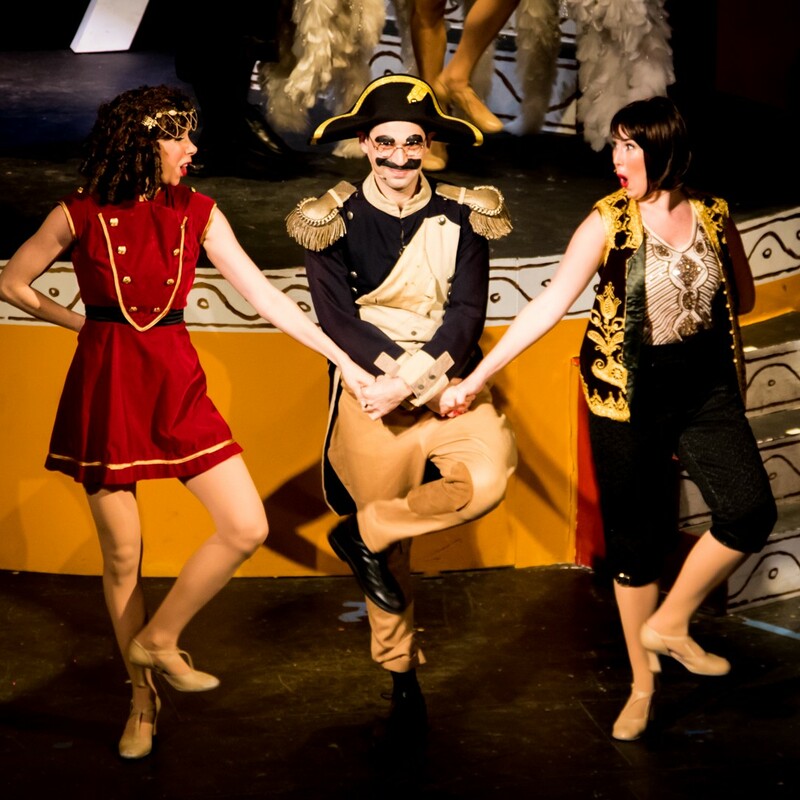 “Hail Napoleon”: Ashley Rubin, Noah Diamond, Peyton Lustig. Photo by Mark X. Hopkins. I’ve said, here and elsewhere, that it may be a good thing that the business of performing I’ll Say She Is keeps me too busy for much reflection. Just by taking on this show and these roles, we are standing not only on the shoulders of giants, but in their shadows, and if I get too wrapped up in the significance and the responsibility of representing Groucho Marx to an audience, I might be reduced to a stupor. Nevertheless, when I’ve managed to wriggle my way into Julz Kroboth’s perfect Napoleon costume, and I catch my reflection in the full-length mirror in the common area, I always get a lump in my throat, and become very aware of my heartbeat, and think, Oh my god, this is I’ll Say She Is! 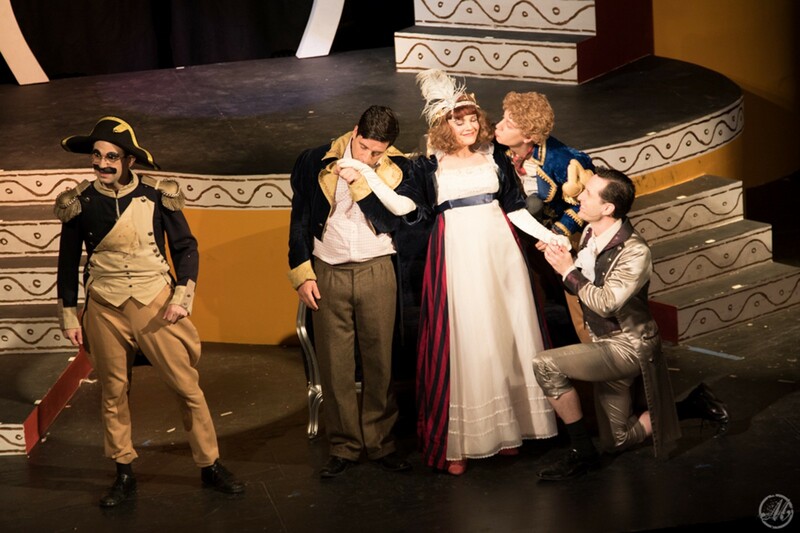 Since I’m already running the risk of preciousness and piety here, I think I’d better not say much about the experience of performing the Napoleon scene. I’m too close to it right now, and too prone to reverence, and I don’t want to fall off the tightrope. I’ll elaborate some other time on this particular ascent — beyond the Alps lies Peter’s Milk Chocolate. Noah Diamond, Matt Roper, Melody Jane, Seth Shelden, and Matt Walters. Photo by Mark X. Hopkins. “The Inception of Drapery”: Robyn Michele Frank, Peyton Lustig, Sarah Miller, Melody Jane, and Kathy Biehl. Photo by Mark X. Hopkins. 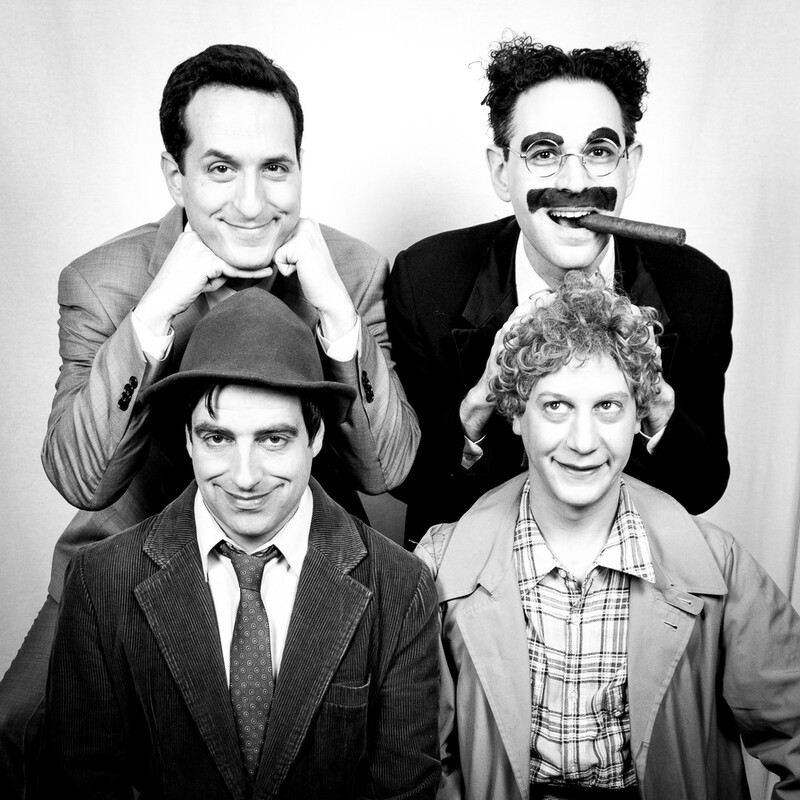 Matt Walters, Noah Diamond, Matt Roper, and Seth Shelden as the Four Marx Brothers. Photo by Mark X. Hopkins. Each one a gem, these Brothers of mine. The dynamics of the quartet feel just right (from the inside, anyway), not because we are exactly like the Marx Brothers, but because our actual group dynamics happen to rhyme with theirs in fortuitous ways. Seth, Roper, and I were all born within months of each other (late in 1976 and early in 1977) — as with Groucho, Harpo, and Chico, there’s no obvious age difference — while Walters is a few years younger. Walters and I are old friends, for whom a brotherly dynamic is natural, and it makes sense that he pairs up with me, as Zeppo did with Groucho, in balance of the Harpo and Chico partnership. Seth and I, to my surprise, have known each other for less than three years, and we’ve never really done anything together besides I’ll Say She Is — but this has been so intense and personal an experience, and Seth’s commitment to it so profound and transformative, that a fraternal bond exists. And Matt Roper is the brother none of us knew before this production, but all of us loved immediately; his separateness, along with Roper’s undeniable tendency to be British, makes an excellent analogy for Chico’s own separateness, his aloofness and mystery. I have a separateness, too: As the guiding producer and surviving author of the work, I occupy a slightly different spot on the diagram than the other three guys, and this replicates some of Groucho’s isolation. “Glimpses of the Moon”: Noah Diamond and Kathy Biehl. Photo by Jim R. Moore. During “When Shadows Fall,” I have a frantic quick-change. Lyrics written on my heart whiz through the air, along with sleeves and tails. I appear onstage only briefly during “When Shadows Fall,” and it’s a rare calm moment for Groucho and me, after which it’s another dash through the backstage crossover to join Kathy, stage right, for “Glimpses of the Moon.” (Add “Glimpses,” and many other details of the show which I’m glossing over here, to the list of spoilers withheld.) Seth and I both have brief appearances in the opium den sequence, which is dominated by the Apache Dance (exquisitely rendered by Peyton and Dante) and the “Dream Ship” number (exquisitely rendered by Melody Jane and Chorus). Amber Bloom, ladies and gentlemen — talent, brains, beauty, and impeccable taste in literature. Photo by Kathy Biehl. After the opium den comes the Chico specialty, one of the evening’s musical highlights, for which Sabrina Chap deserves a whole separate playbill worth of credit. Chico Marx sits on that piano bench thanks largely to her — though of course it helps that Roper is a great entertainer, and that his Chico is uncanny, charismatic, and hyp-a-notic. But during the Chico specialty, another uncanny and hyp-a-notic spectacle is occurring, totally unbeknownst to the audience, in the stage right wing. 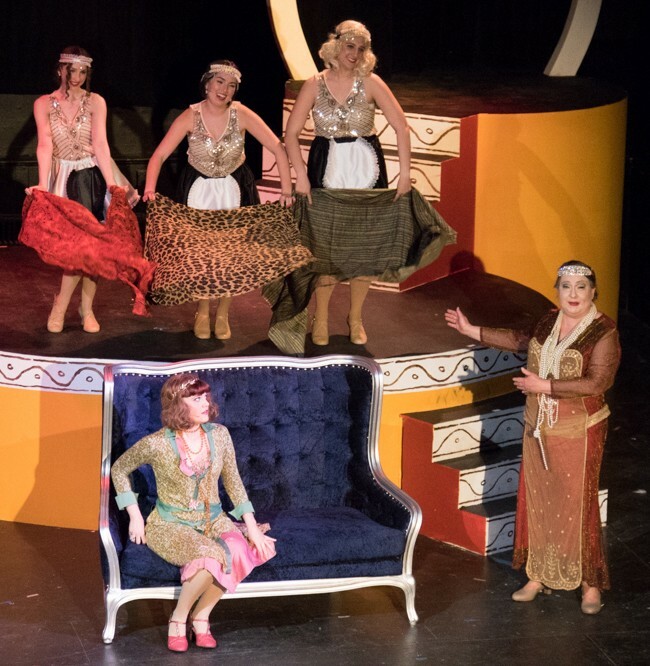 While Chico and “the brassy broads” Jessica, Jennifer, and Avital slay the audience (assisted by Shelden, Chap, and Talmage), Amber Bloom and Sarah Miller perform a backstage specialty for their own amusement. It’s a hilarious dance duet, too depraved to describe, and burned forever on the brains of all who have witnessed it. Bloom and Miller then quickly and seamlessly transition to their next task, a mighty and lightning-fast effort to assist Seth with his costume and prop preparations for the courtroom scene. The trial is a Marx Brothers comedy scene if ever there was one (and I’m pretty sure there was one), culminating in an immortal classic. Then we tie up the love story, sing a song, and call it a night (though the ending of I’ll Say She Is, in its current incarnation, does contain surprises I’m withholding here). During “Only You,” Matt (Roper) and I are standing together, downstage left, looking on approvingly while Matt (Walters) and Melody croon Will B. Johnstone’s words of devotion. Matt is funny, dashing, and charismatic, in the full-fledged romantic leading role nobody quite managed to provide for the original Zeppo; Melody looks and sounds lovely, falling for Zep and his Brothers night after night; Kathy and I communicate years worth of wish-fulfillment with our eyes as we sing our chorus of the song; the entire company bursts onstage for the finale; Seth leaps into Mark’s arms; I’ll Say She Is is on stage in New York and either this is real or it’s a beautiful dream. The I’LL SAY SHE IS Company. Photo by Mark X. Hopkins. A common refrain from people who love the show, and even from a number of critics, is that I’ll Say She Is should have a life beyond this run at the Connelly. Needless to say, I hope that it does. But at this moment, halfway through the run, my prevailing mood is not ambition but pinch-me. It should have a long life; it deserves to, and I do think it will. But it doesn’t have to, for me to feel satisfied by it. It doesn’t have to get back to Broadway, and it doesn’t have to put one penny in my moth-eaten tailcoat pocket. The show, and everyone associated with it, has given me so much, I can only be stunned and filled with gratitude for the fact that it exists. So, we’ll see, okay? After the cast and the audience have departed, and Brett and I have closed up the front-of-house operation, and Rich has collected the microphones, and Tom has shut down the lighting board, and Amanda and Sarah have wrapped up another night’s assorted showbiz emergencies, it’s time to go home. Goodnights and I-love-yous are exchanged, and we leave the Connelly in the still, ghost-lit splendor in which we found it. Minutes later, Amanda and I are barreling homeward in a cab to Washington Heights. I’m exhausted and exhilarated, unable to do much of anything, including calm down, yet impatient to get back to the theatre and do it again. The city flies by, surrounding us on all sides, and I see the bright lights, the excitement, and Amanda, and I can’t believe my luck. is bright enough to see. We’re alive, and what a thing to be! Baby, Broadway’s just for you and me. 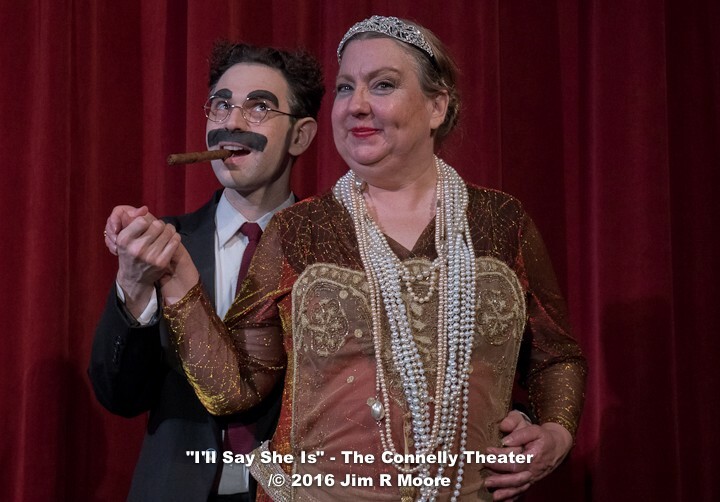 I’ll Say She Is concluded its Off Broadway run at the Connelly Theater on July 3, 2016. For more information, please visit illsaysheis.com or noahdiamond.com.